It's tricky with biographical films. On the one hand, the film should stay close to the true events, on the other hand also weave an interesting story, something that is not always compatible. Angelina Jolie is the director of just such a difficult biographical history. "Unbroken" is based on the autobiographical book of the same name by Laura Hillenbrand, the Olympic athlete and war hero Louis Zamperini (O'Connell). His story is extraordinary: 1943 Zamperinis bomber crashed into the Pacific Ocean, and he survived the entire 47 days lapping Spirit on a raft in the water. Once he was rescued, it was the Japanese, who put him in prison camps - which he managed to survive until the Second World War. Louis suffers terrible physical and psychological trials, from famine aboard the raft in the sea not to have disintegrated in the sadistic jailer Watanabe (Ishihara). "Unbroken" is trying to realistically convey Zamperinis enormous willpower, which is underpinned by flashbacks from his messed youth and later the athletic career. But the film never really gets close to him. Next we are in Louisville when he talks about the mother's gnocchi in the low-key and desperate scenes in the raft. It is in these scenes "Unbroken" grabs. The brotherhood that is emerging between Phil (Gleeson) and Louis visualized credible and intimate. But when history is increasingly beginning to be about sadistic torture, war, misery and less and less about Louis loses his footing movie. That the personal history boiled down to willpower alone creates a distance of Louis. It may be the film's final third to limp, and when the abrupt end comes, I almost lost interest. Jolie's directing is stable, but conventional. 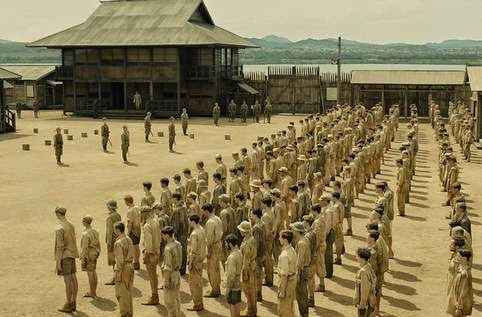 Most scenes familiar from countless other war films, and that's to say the least ironic that "Unbroken" is emerging as a mimicry. The big problem is that "Unbroken" neither focuses entirely on good storytelling, or even to authenticity.